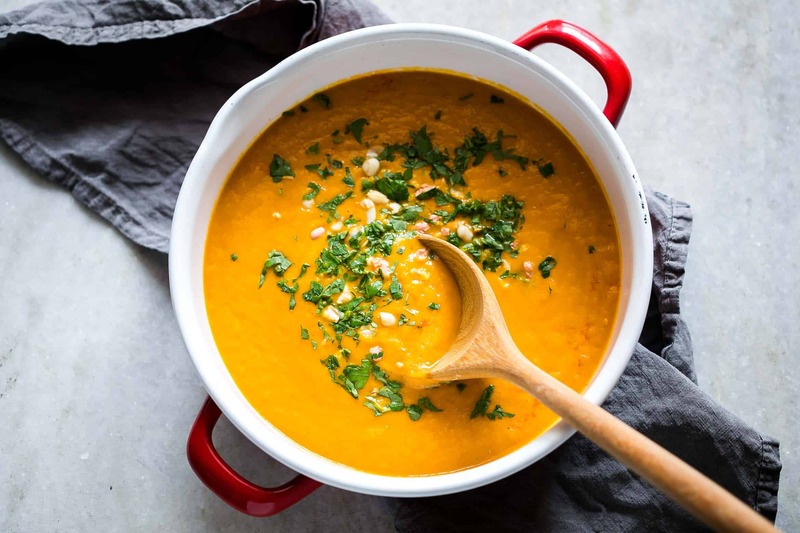 This Thai Butternut Squash Sweet Potato Bisque is perfect for cold winter days – super thick and creamy soup with a hint of heat that will keep you warm and cozy. It has all the fall flavours and ingredients – onions, carrots, butternut squash, sweet potato, thai curry paste and coconut milk. Let me just clarify first that a bisque is like a thick and creamy soup that’s usually pureed so its slightly different from a chowder which has the same thick, creamy consistency but is chunky; and soup which isn’t usually as thick but can be smooth or chunky. There! Thats our food trivia for the day. I just learnt this when I was researching bisques and had to share with you guys too. Back to this beautiful thai butternut squash sweet potato bisque which is just as beautiful as its delicious. You can’t go wrong with these flavours, especially when its starting to get chilly. Or maybe it’s already chilly where you stay. This thick, creamy bisque is perfect when you are busting out the sweaters and winter wear. When I say thai butternut squash sweet potato bisque – that can be quite a mouthful, but you have to admit that its tempting. Because these flavours were made for each other. Just like this soup was made to go into my tummy! While I usually prefer soups which aren’t as thick as this bisque, I love this one because the weather deserves soup which can be eaten and not slurped. This bisque is the consistency of really thick cream, and has to be ‘eaten’ with a spoon, but because of that, it feels more like a full meal. I really noticed that I started feeling full faster, probably because of the fact that I was eating it and not drinking it. The process is extremely simple – you just saute the thai curry, onions, carrots together and then add cubed butternut squash, sweet potato, coconut milk and simmer. Finish it off with some fish sauce and blend. 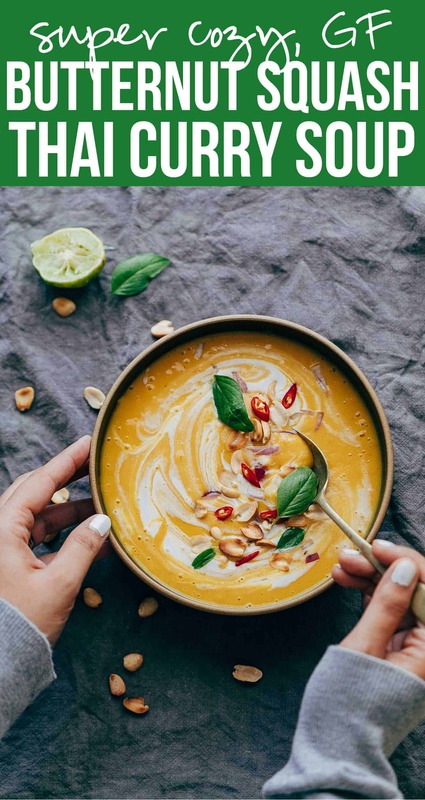 The result is this beautiful, thick and creamy thai butternut squash sweet potato bisque that will be made again and again and again! Before you go off to try this out, don’t forget the toppings! I love adding chopped red onions, sliced thai chilies, roasted peanuts, a squirt of lime and thai basil. This bisque needs the toppings to add texture and depth, so go wild! 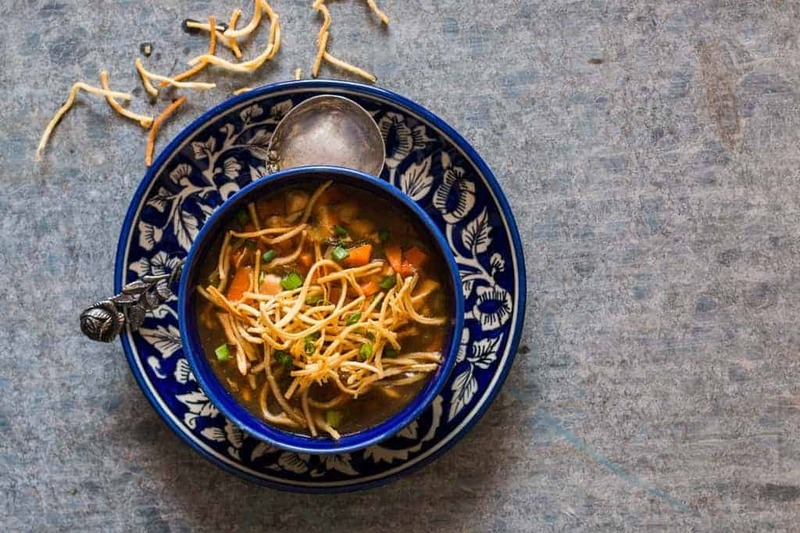 Dip some bread in, or serve this with spring rolls. Or just eat it like a meal like I do. This Thai Butternut Squash Sweet Potato Bisque is perfect for cold winter days – super thick and creamy soup with a hint of heat that will keep you warm and cozy. It has all the fall flavours and ingredients – onions, carrots, butternut squash, sweet potato, thai curry paste and coconut milk. Watch the Recipe Video above. Cook: Heat oil in a large pot and add thai green curry paste. Saute for 2-3 minutes till fragrant and add onions. Cook the onions till slightly translucent and add the carrots. Cook the carrots till they soften and add the butternut squash, sweet potato, coconut milk, water (whisk together the coconut milk and water and add it to the pot) and salt. Bring this to a boil, and then reduce the heat to a simmer. Cover and cook for 20-25 minutes till the butternut squash and sweet potato have softened and can be easily smashed with the back of a spoon. Add a little more water in between if necessary. Mix in the fish sauce. Blend: Add everything to a blender and blend till smooth. My blender allows me to add hot things and blend, but if yours doesn’t, let everything cool before blending and then reheat to serve. Serve: If cooling everything before blending, reheat the bisque, top with your favourite toppings and serve hot. 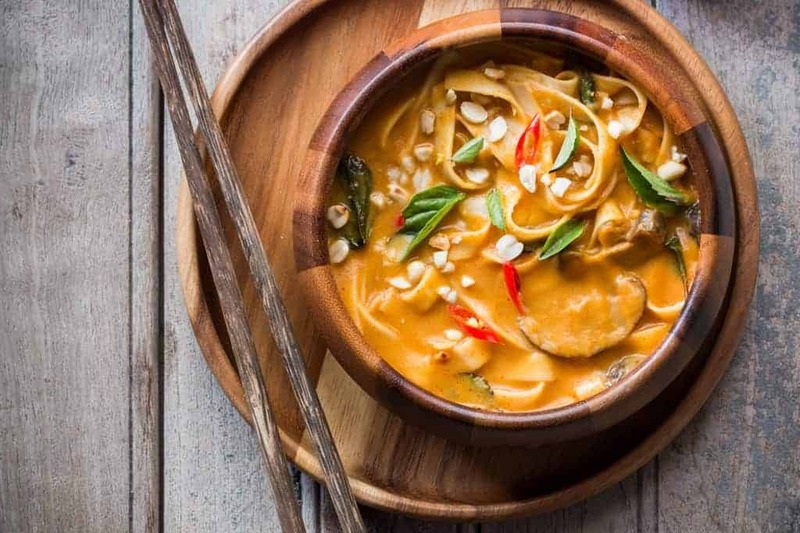 You can substitute Thai green curry paste with red curry paste. The flavours will be slightly different, but both taste delicious!